As I walked the grounds of the Shrine of Our Lady of Sorrows in Starkenburg, Missouri, it was as if I could hear the whisper of history. Perhaps it was because it was a warm and sunny mid-October day. Perhaps it was because it was a quiet Monday and fewer folks were visiting than during the rest of the week. Perhaps it was the solitude of its rural location. Or, perhaps history really was whispering to me. I think it was all of the above, but most particularly the latter. 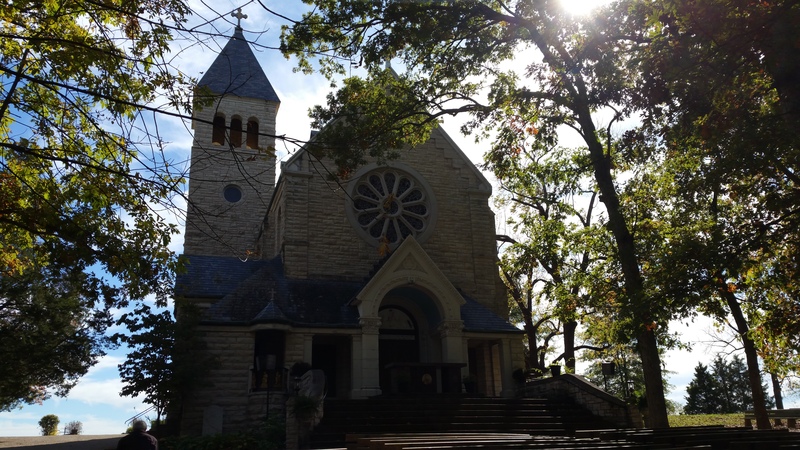 The Shrine of Our Lady of Sorrows dates back to 1847 when German settlers came from the neighboring town of Hermann, on the banks of the Missouri River. (I’ll be writing more about Hermann and my wonderful experiences there in a future post). The Germans loved this area because it resembled the Rhineland from which they’d come and reminded them of home. When missionaries traveled to their area, they’d have special services in a barn that served as a makeshift church. In that barn was a statue of the Blessed Virgin Mary that the Germans named the “White Lady.” A year later, they built a log church on forty acres and chartered a parish named after St. Martin of Tours. 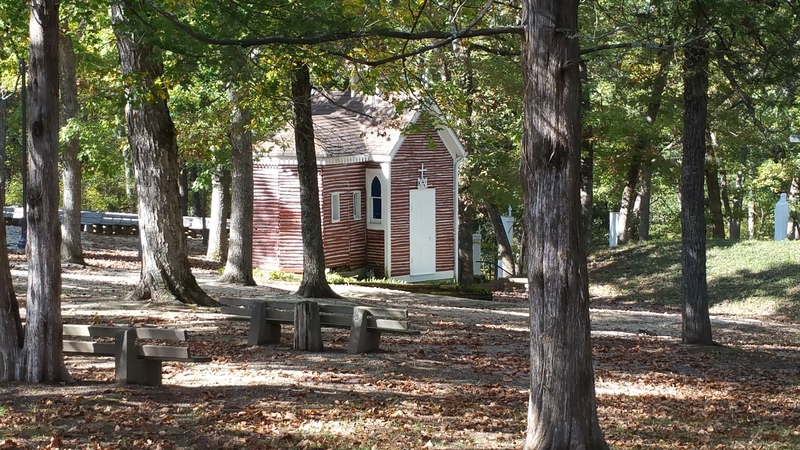 In 1852, the parishioners of St. Martin’s built a small log chapel – a new home for the White Lady – and frequently conducted processions carrying the statue around the grounds. In 1874, a new stone church replaced the old log one and some years after that the White Lady was replaced with a larger, more exquisite statue of Mary. The White Lady was relegated to an attic storage space. 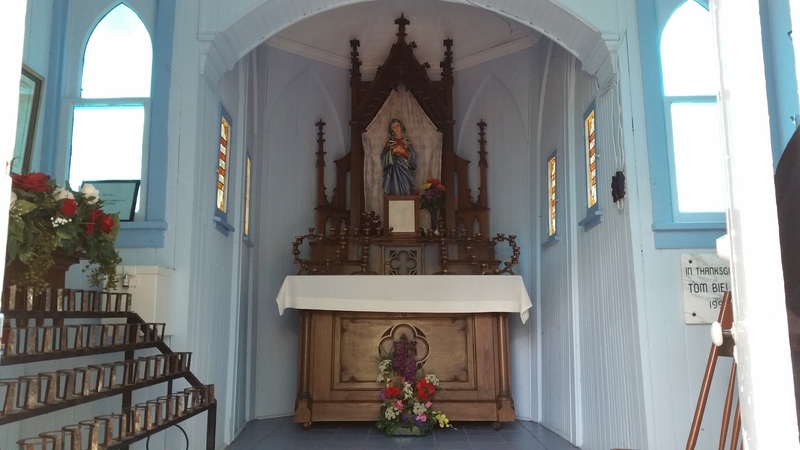 In 1888, St. Martin’s new pastor brought the White Lady out of storage and made a May altar for her in a beautiful dogwood bush on the property. Shortly after, a new log hut followed by a slightly larger wooden chapel was built to protect the statue. 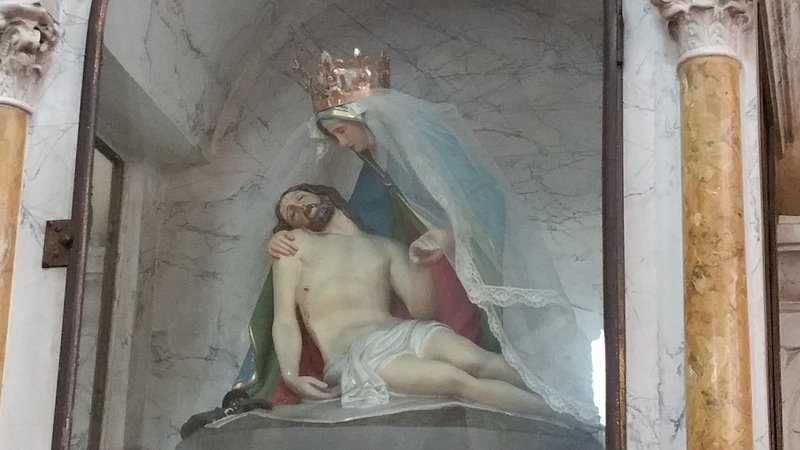 Two years later, the parish was able, through generous donations, to purchase a replica of a famous statue honored in the Cathedral of Muenster, Westphalia titled, “Pieta of Achtermann” crafted by a skilled artist from Dusseldorf. This Sorrowful Mother statue replaced the White Lady and became a treasured place of grace and pilgrimage for the faithful from miles around. Miracles have taken place on these grounds. In the Spring of 1891, ceaseless, torrential rains prevented the farmers from planting their crops, thus threatening their livelihood. The people gathered at the shrine for a solemn procession with the statue of Mary. The next day dawned bright and sunny and the farmers were able plant and reap a rich harvest that year. In June 1894, drought threatened the area. The night of June 24-25, a fire broke out and burned the chapel but the statue of Mary remained untouched by the flames. At the shrine’s side altar are pairs of old wooden crutches left behind by those who hobbled in and then walked out after begging our Sorrowful Mother’s intercession. 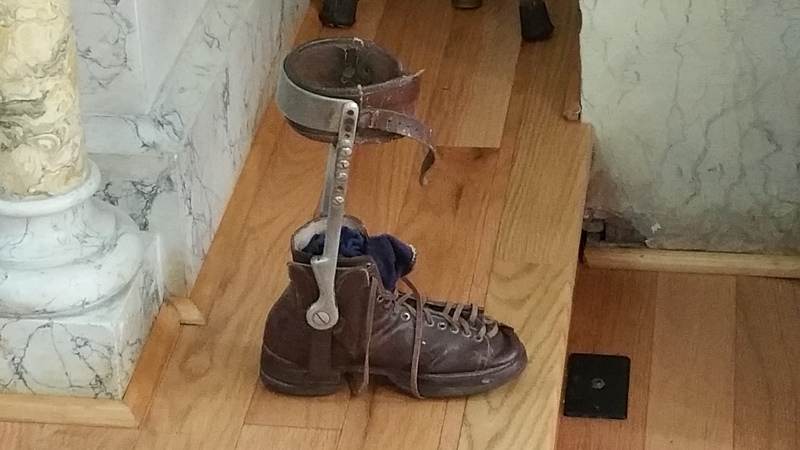 A shoe brace rests there, left behind by a young woman in 1935. She had been infected with polio, and one leg became diseased and consequently was left shorter than the other. Near the Lourdes Grotto is a well into which waters from the spring in Lourdes, France has been added repeatedly. The woman’s parents brought her over and over again throughout the weeks and years, washing her leg in the holy water and praying for a miraculous cure. Finally, surgery was scheduled to remedy the problem. The young woman was prepped for surgery and the surgeon entered the operating room. He stopped just as he was about to begin the procedure. There was no need for the surgery, he told his staff. There was absolutely nothing wrong with the young woman’s leg! In gratitude she brought her shoe brace to our Lady and left it there at her feet in the shrine. The entire complex is a testimony to the grit, hard work, and devotion of the German immigrants to the area and a tribute to their enduring faith. Walking the grounds, I could feel, not history of days gone by, but history of the present moment, if that makes any sense at all. I merely had to close my eyes to see the German immigrants – weathered, hopeful, and completely devoted to our Sorrowful Mother – making their way in procession over the property. I could hear the bells ring, summoning the faithful to Mass and smell the incense from the altar boy’s censor. 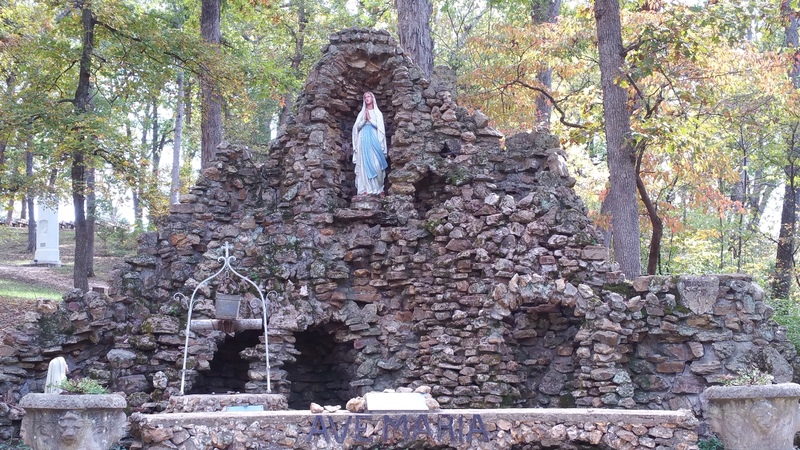 History came alive for me that day as I nestled myself into Mary’s heart at the Shrine of Our Lady of Sorrows in Starkenburg, Missouri. It is indeed, the whisper of history. 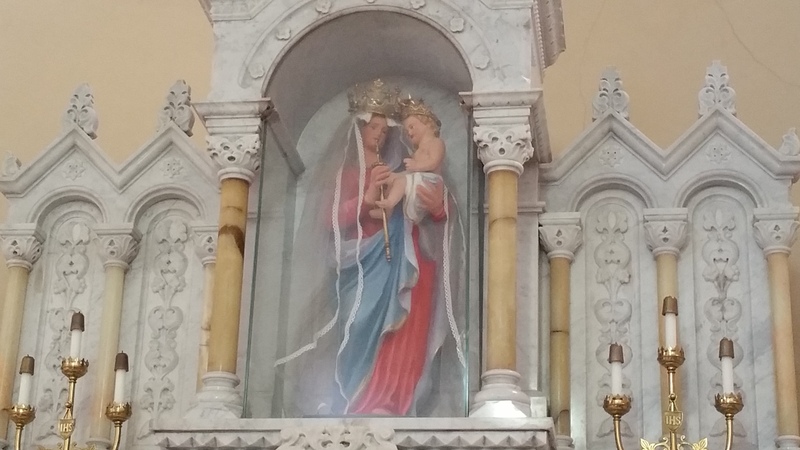 Blessed Virgin Mary, Catholic Church, Marian Pilgrimage, Saints, spirituality. Bookmark.